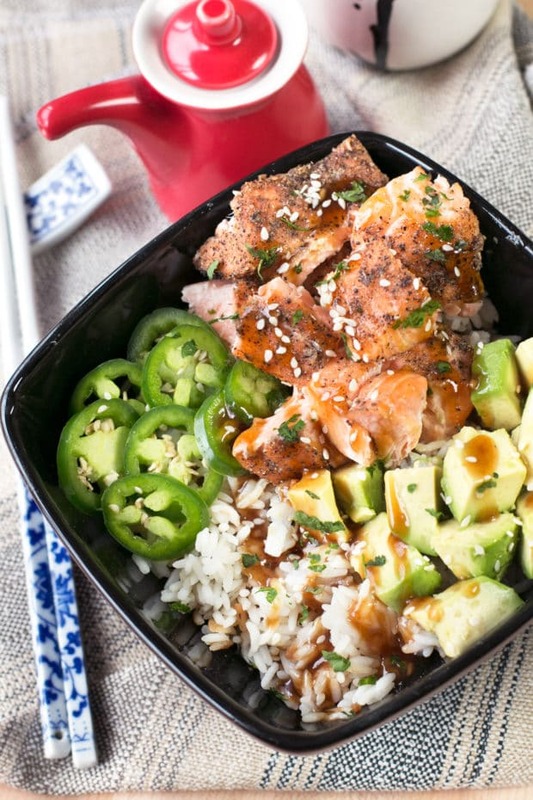 Sesame Salmon Avocado Bowls are a rich and hearty bowl of delicious Asian flavors that won’t have you worrying about your waistline. Broiling the salmon gives it a crust that gives a wonderful texture to break up all the creamy avocado and fluffy white rice. When I was in Hawaii, I had the most amazing poke bowl. 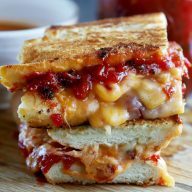 It was rich and creamy, full of a variety of flavors and incredible fresh. When I loaded it up with extra jalapeno slices and wasabi, it was darn near the most amazing bowl of fish, veggies and rice that I’ve ever had. Now before you all start freaking out on me… Yes, I am aware that this is NOT a poke bowl. Unfortunately being located in a landlocked state, I am fairly limited to incredibly fresh raw fish to make poke with. 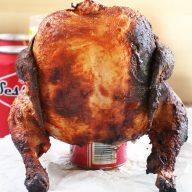 If I wanted to hunt it down, you can bet that it’s going to cost me an arm and a leg to eat a little bowl. 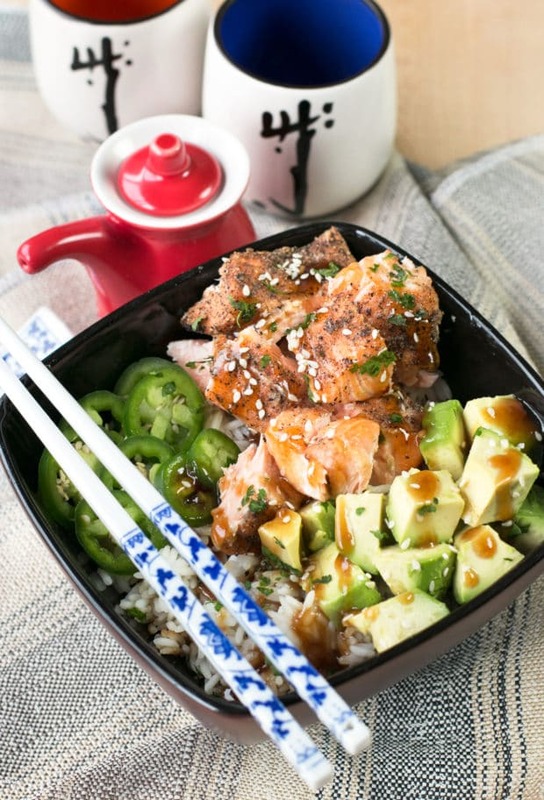 I LOVE eating salmon both in poke and on a regular basis, so I took two of my favorite meals and smashed them together in one bowl of creamy, spicy flavors. So basically this is your new spring and summer meal that you won’t be able to get enough of. 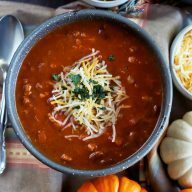 Now that seasons have shifted, I am getting out of the comfort food mode and right into fresh, flavorful meals filled with all the fruits and veggies I can find at the market. 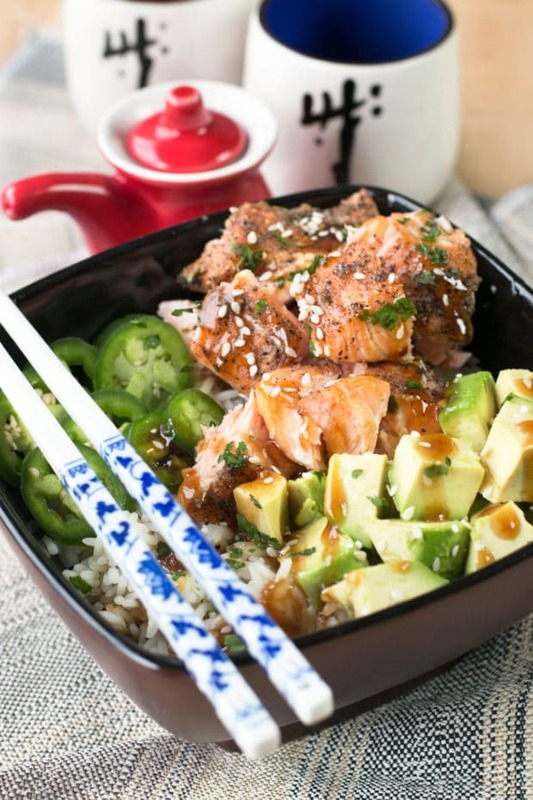 When you pile up creamy avocado, spicy jalapeno, and salmon on top of a fluffy bowl of rice, you get a variety of textures and flavors that will bring your taste buds out of their winter coma. The crust on the salmon is so flavorful when the fish is broiled, so it isn’t just a giant bowl of the same texture all the way through. Instead you get a perfectly balanced bowl to satiate that appetite, without being fattening! We’ve all got to start worrying about those summer bods at some point… right? That’s what normal people do? 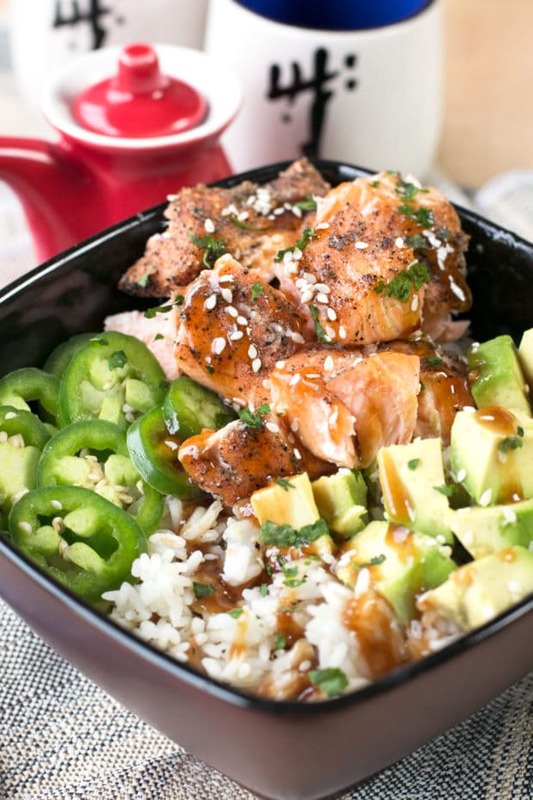 Pin this Sesame Salmon Avocado Bowls recipe for later!